Sorolla's conversations with Huntington led to a contract in November 1911 to decorate a room at the Hispanic Society with a series of large canvases representing the Provinces of Spain with their typical regional costumes. 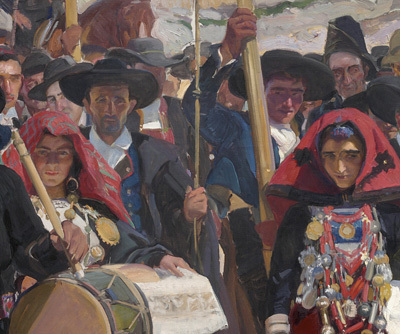 There followed eight years of feverish work as Sorolla crisscrossed Spain seeking models and inspiration for what he came to call his "artist's vision of Spain." The last huge canvas, Ayamonte, was finished in July 1919, but Sorolla died before the series could be installed in 1926. In addition to his loving depictions of regional costumes and activities, Sorolla fills the fourteen murals with many dazzling passages. In the various paintings of Andalusian themes, he renders reflections in a pool, the dark costumes of Holy Week penitents, and bullfighters saluting the president of the corrida with a sure and vivid touch. In Ayamonte, the artist offers another superb demonstration that "white" is never just white, filling the sailors' costumes and the sails with color. Just as important, when viewed as an ensemble the murals constitute one of Sorolla's crowning achievements. The result is one of the most impressive interior spaces in New York City and remains an enthusiastic celebration of the diverse regional cultures of Spain.